We keep chugging along, beautiful TGN readers. The week rolls by and we continue on as well. It's that time once more to bring you some bite-sized stories we've come across in the past few days. In this batch we have: New Goodies in the Advanced Deployment store, New Warthrone approved army list: Tomb Kings from Warhammer, Tobsen77 Iron Horse huge artillery now available, First Hammer's Slammer Detachment Pack Available from Brigade Models, Crooked Dice release the Weed, Meridian Miniatures releases Rat Warlock, Ogres coming soon at 15mm.co.uk, Nvenom8 Designs Releases Kraken D20, West Wind Productions Releases Steam Velocipede for Empire of the Dead, New American Civil War Zouaves from All the King's Men, and Classic Large Goblins now at 15mm.co.uk. In Warthrone, massive armies clash for dominance on the battlefield. Countless footmen, pikemen, and bowmen fight while the various heroes of the armies blast and bash huge holes in the enemy forces. It's those heroes that we're here to focus on at the moment. Two new ones are available over in the Avatars of War webshop. They're the Cirlean Imperial Wizard and the Knight of Drumminor. We continue on with the post-Gen Con week's work. Though I was able to keep up with a lot of things, obviously, things are going to fall behind in some areas. I'm almost out of the mountain of e-mails I'd gotten over the weekend. If I've not replied to you yet, don't worry, I will. There's just a lot to sort through. At the moment, though, it's sorting through a bunch of bite-sized stories. This time around we've got: Age of Tyrants Updates Rulebook, New Heroic Scale Female Heads from Statuesque Miniatures, Fablestone Dice: Bone Origins now on Kickstarter - fantasy themed dice with innovative features, Another Warthrone approved army list: High Elves from Warhammer, Khurasan releases 15mm Middle Eastern Irregulars, Free Miniature for August from The Ion Age, Pay What You Want Adventure Module Now Available, New 32mm Lava themed bases Available from Dark Art Miniatures, Evil Bear Wargames First Release: Bear Tactical Hardsuits, and some more installments of The Fiver from The Meeple Mechanic. With the drive to Indy yesterday, I obviously didn't have much of a chance to make posts (and no, trying to type in the car all day was not an option. I would've gotten all the carsick). 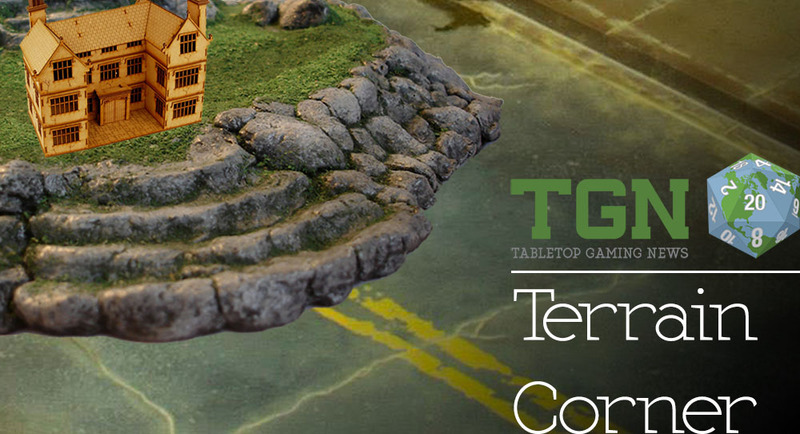 So today I bring you both the Midweek Snippets and today's Terrain Corner together again in one place. 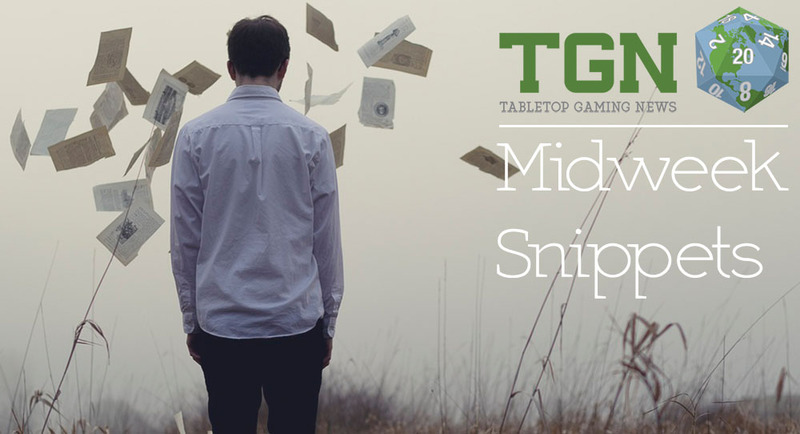 In this batch of bite-sized articles and terrain stories we have: DLD Productions website now open, Web-Based RPG Toolset City of Brass Opens, New Releases Available from Hitech Miniatures, Pondemonium! A free print'n'play boardgame or 3D wargame, Now available – Ruins of Sanctuary 30mm RL deal (20x bases) and 40mm RL deal (8x bases), PK-PRO - Aetztech new etched brass, Werewolf Tokens Up On Kickstarter, Wheel of Flame Gaming Candles Up On Kickstarter, New Warthrone approved army list: Skaven from Warhammer, Free PDF at The Ion Age: Shia Khan Empire in Patrol Angis, Brigade Models - new 15mm SF Buildings, New Manorhouse Workshop Pre-painted – Tabletop Terrain, Some more installments of The Fiver from The Meeple Mechanic, Kromlech New Release - Legionary Pistols, and Icarus Miniatures Preview The Gunslinger. They say time goes by when you're having fun. Apparently, I've been having the time of my life all week, since it's just rushed on by. I swear I was writing up the Monday Terrain Corner about an hour ago. But then again, with all the ramp-up to Gen Con keeping me rather busy, it's no wonder it feels like everything is just rushing on by. Gotta take this weekend to relax a bit and get those last few things ready before heading to the show in the middle of next week. But that's as may be. At the moment, we've got some more bite-sized stories for you. 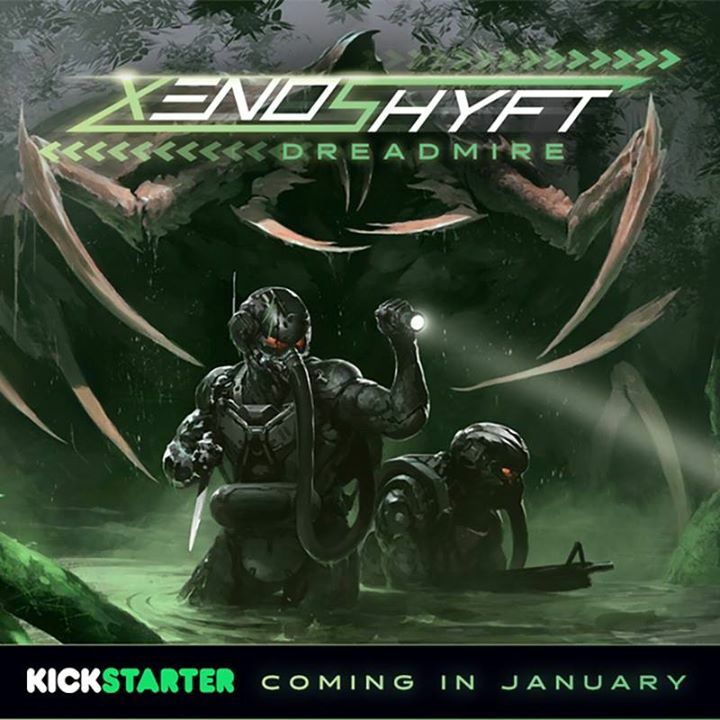 In this batch we've got: New Pathfinder PC SoundSets from Syrinscape and Another Warthrone approved army list: Legions of Khorne from Warhammer. It would seem that it's a rather popular week to put out fantasy miniatures rules in new versions. Avatars of War has had their Warthrone rules around for a while now, but if you were an English-only speaker, you weren't so much in luck playing the game. Well, now you can download the rules in English and see what you think about them. Avatars of War is taking advantage of the recent value-drop for the Euro and is having themselves a sale over on their webshop to celebrate (sort of). 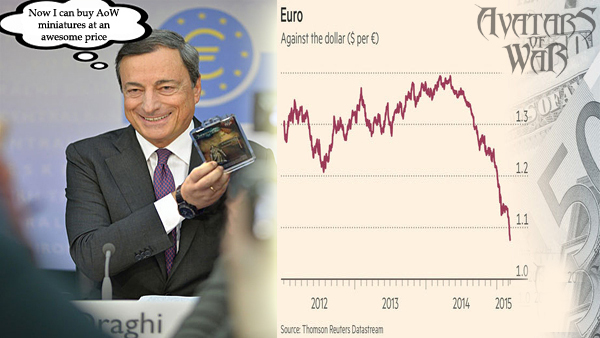 At any rate, those that had always feared exchange rates will be happy to know they can get Warthrone and Arena Deathmatch minis for a bit cheaper right now. 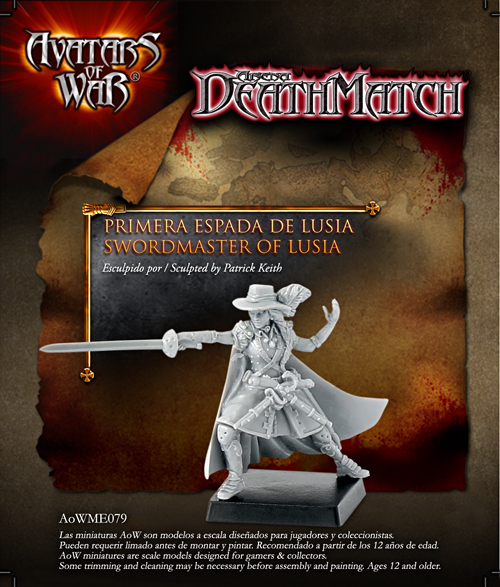 Avatars of War has a trio of new releases available over in their webshop. They've got two new releases for Warthrone and one for Arena Death Match. For Warthrone, there's the the new Goblin King of the Labyrinth and the Berserker Tyrant (sounds like an old boss I used to have at a previous job). For Arena Deathmatch, there's the Athlean retiarius. Go and check them out on their website. 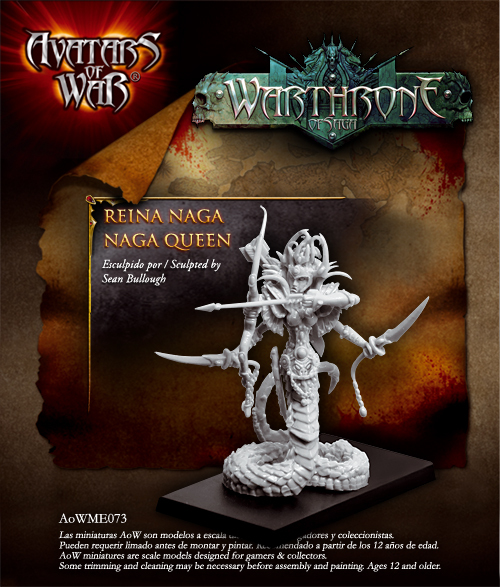 Avatars of War has posted up their new releases. They've got some for both Arena Deathmatch and Warthrone for you to check out. New items for Apocalypse, Cirlea & Dark Elves! Right before christmas, no less than 6 new releases. Three for each Warthrone and Arena. Avatars of War is bringing the Marauders of the Apocalypse to Warthrone. Will you dare stand in their way? This month reinforcements for the Legions of the Apocalypse! 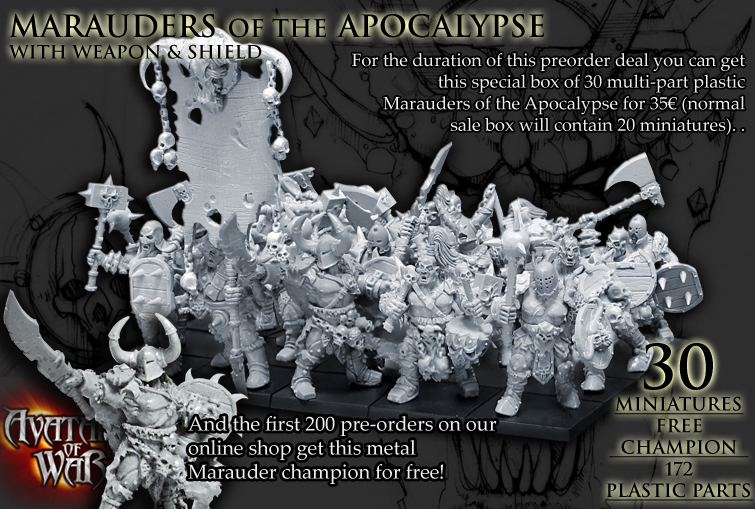 The Marauders of the Apocalypse are now available for preorder with a very tasty preorder deal: 30 Marauders for 35€, plus the first 200 preorders get for free a new metal Marauder Champion! 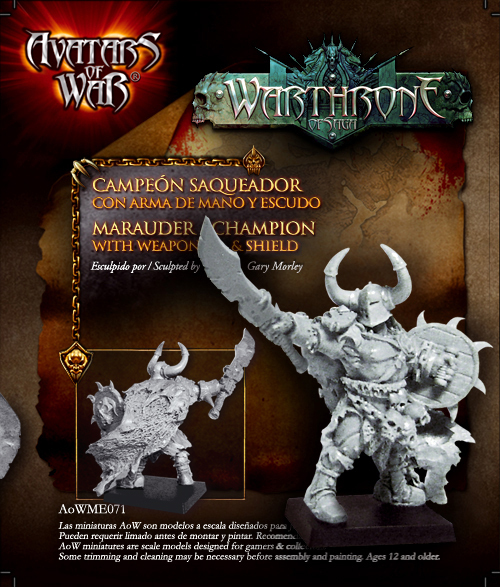 If you plan to get the Marauders be sure to make it on the first 200, as 30 miniatures plus metal champion for 35€ is for sure a tasty offer! Avatars of War has a couple new releases available over in their webshop for you fantasy-gaming-types to check out. Preceding the upcoming Iron Guard regiment for Warthrone, is the Champion of Göllnir. The Iron Guard form the personal guard of a Dwarf king. Each Iron Guardian is appointed by the king himself, from the most courageous, skilled and tenacious of his warriors. Champions of Göllnir are the best of the chosen, only below the noble Dwarf Lords in power and command. We also unveil the first of the new range of miniatures exclusively designed for Arena Deathmatch, the game of gladiatorial combat. A Dwarf Berserker armed with bladed gauntlets, ready to impale those who dare face him in close combat! 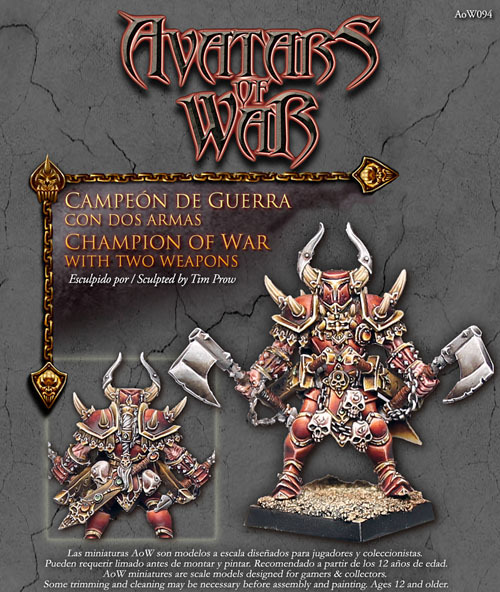 Avatars of War now has their Warthrone 1st Edition book, in Spanish, available to download over on their website. 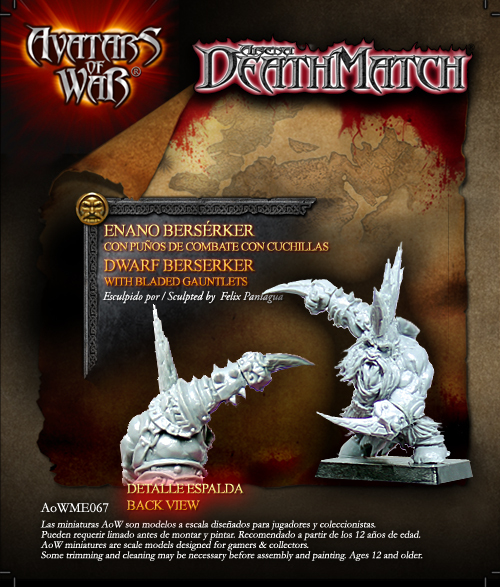 The final Warthrone rulebook (Spanish) is available for download! Since we published the Alpha rulebook over a year ago, hundreds of games have been played all over Spain and many players have sent their ideas, suggestions and improvements which have been applied to the rules system, to obtain the final rulebook for the 1st edition of Warthrone. A big thank you from Avatars of War to all those who have playtested Warthrone! 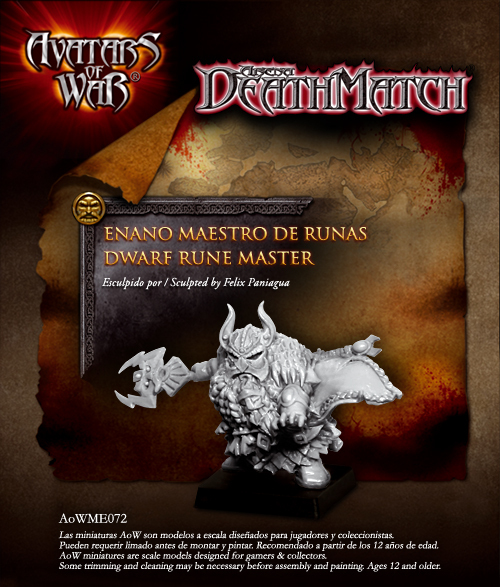 Avatars of War is running a special on their Dwarf Pathfinders going on now over in their webshop. After receiving the first batch of orders from retailers, we have about 200 boxes of Dwarf Pathfinders left in the AoW warehouse. Since it would be a big success if this first run of boxes was completely over before the next restock arrives, we have decided to make a online shop special! For the duration of this stock (about 200 boxes) you can get the box of 20 Dwarf Pathfinders for 30 € (the RRP is 35 €), and get for free a miniature of the Dwarf Berserker Borg Ironfist (only available so far with the Vallejo-AoW paint set). 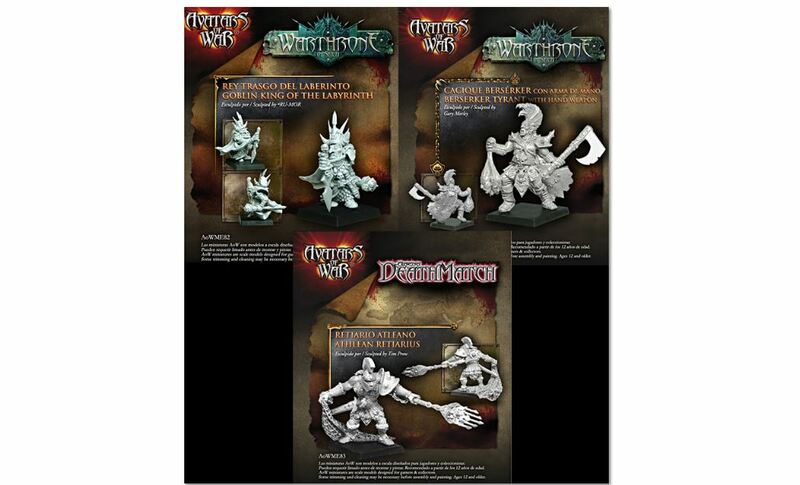 Avatars of War has a couple new releases available over in their webshop. 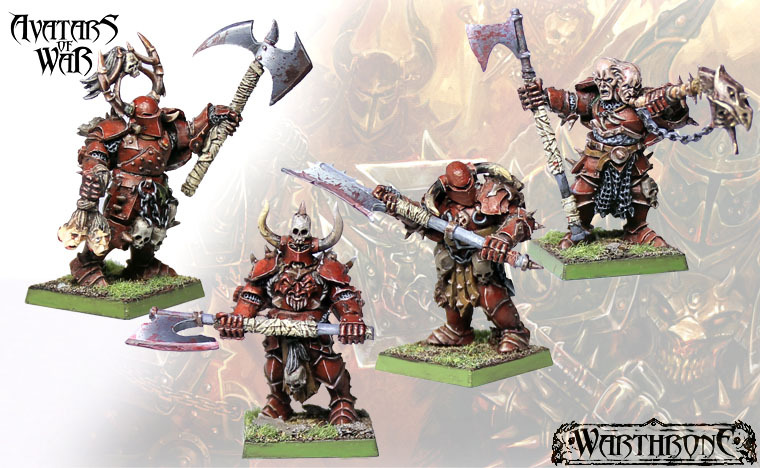 They've got a new Dwarf Berserker with great weapon and new plastic Dwarf Pathfinders. 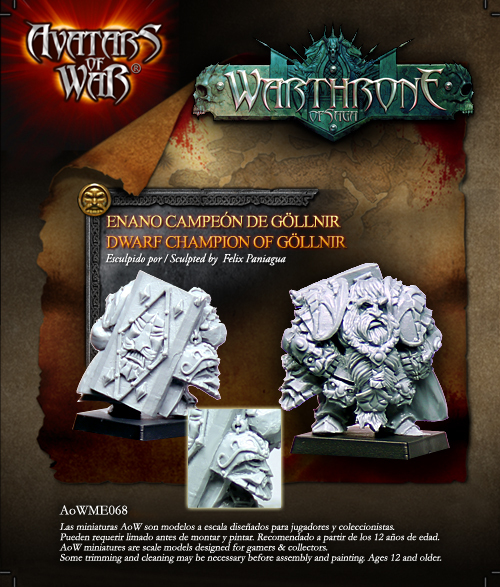 This month two new releases for Dwarfs! 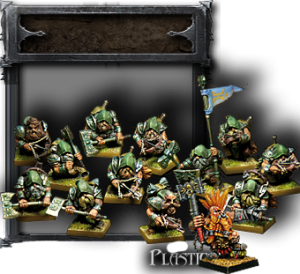 Dwarf Pathfinders (plastic): This box contains the plastic pieces to assemble one 20-strong or two 10-strong Dwarf Pathfinders regiment with crossbow and great weapons. 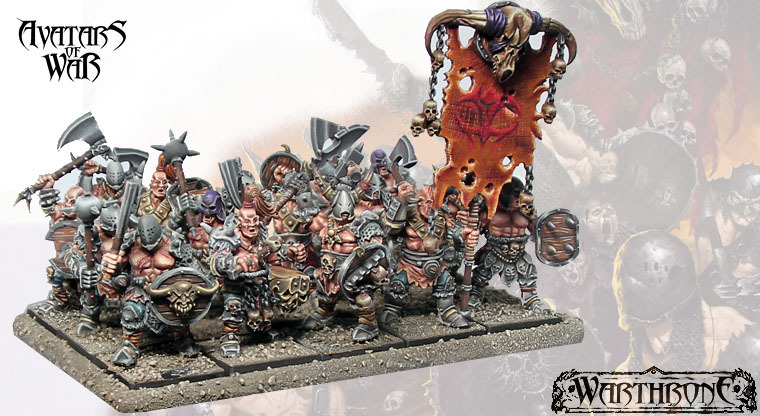 Contains the optional pieces to assemble one or two command groups (leader, standard bearer and musician). Berserker Lord with two-handed weapon (metal): A new metal Berserker Hero, this time armed with a great axe. Can be assembled with different hairstyles, including the new spikey hairstyle that we introduce with this Dwarf Berserker figure!